The latest whisper on the grapevine is that Nvidia’s third-party graphics card manufacturing partners will be getting shipments of next-gen GPUs in August (or possibly early September), meaning that fresh GeForce video cards – likely called GTX 1180 (at least in the case of the initial flagship) – will be inbound shortly thereafter. This info comes from Wccftech.com, with the tech site claiming to have received confirmation of the aforementioned shipping timeframe, which follows previous rumors indicating a Q3 (July to September) launch for the next-gen GeForce cards. 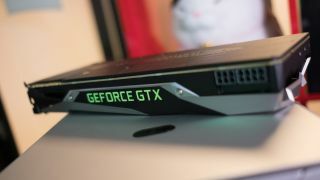 If GPUs are sent out to graphics card manufacturers in August, the argument is that we should see Nvidia’s GTX 1180 (or whatever it ends up being called) Founders Edition being launched probably just a few short weeks after – so, maybe September. Obviously that’s far from guaranteed, though, and a lot will depend on whether any technical problems are encountered with the new (thought to be codenamed Turing) technology over the homestretch. However, things are likely to move fast once the GPUs are shipped out to third-party manufacturers simply because, at that point, leaks are going to be difficult to prevent, so Nvidia better be ready to go. After disappointing news of delays – we were previously expecting a launch date as early as July – it’s good to hear that everything could be about to kick off for Nvidia’s next-gen cards. The downside? The report notes that these initial shipments to GPU vendors will be delivered in small amounts, indeed, probably in the low hundreds. And a chunk of those will be used for development boards, which in turn means you can expect supply to be thin on the ground initially. That’s hardly a surprise in the GPU world though, where after launch, the latest video cards can be pretty difficult to get hold of, and thus often command a price premium (although that’s a scenario gamers are familiar with anyway, in recent times, thanks to cryptocurrency miners). All this is speculation, of course, and comes off the back of recent reports that Nvidia has an excess supply of current-gen GPUs after miscalculating the aforementioned demand from cryptocurrency miners, which has now dropped off (not to mention overall demand flagging). That factor could still point to a launch which is a bit further off than we’d ideally like – particularly if folks hold off buying 10-series cards in expectation of imminent Turing products, which may be what’s already happening. Further rumor has it that the GTX 1180 will boast 3,584 CUDA cores, 16GB of GDDR6 VRAM and an FP32 performance (think of that as raw power) of 13 Teraflops (compared to 8.7 Teraflops for the GTX 1080). So, the wait could very well be worth your while.